Scientists said that proved the authenticity of the long-lost Christian document known as the "Gospel of Judas". This is not just a proof of the authenticity of the scroll: The Gospel of Judas, which was considered lost, offers his version of the main Christian story: according to him, Judas did not betray Jesus the way it is treated in the orthodox version. Judas betrayed Jesus, at his request, which was part of his plan, and to free his spirit from his body. For good, this discovery upends many of the basic concepts of Christianity. "For 2,000 years Judas reviled for betraying Jesus. Now newly translated ancient document that tells the other side of the events. "The Gospel of Judas'' tells a story that is very different from the four Gospels in the New Testament. 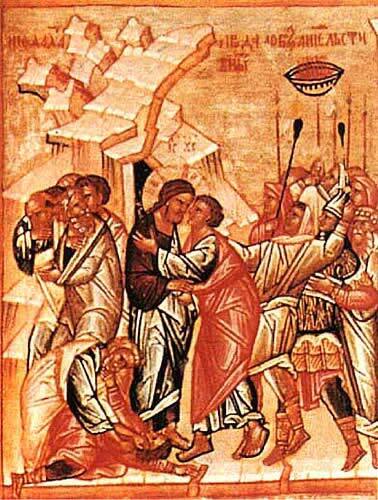 It portrays Judas as a favored disciple who received special knowledge of Jesus, and that at his request, had betrayed him. "You will be cursed by the other generations, and you will come to rule over them,'' Jesus tells Judas in the document being made ? ?public on Thursday. Gospel - one of several ancient documents found in the Egyptian desert in 1970. He was saved and transferred to a team of scientists. It was published in English translation by the National Geographic Society. The text in Coptic was dated around the year 300 and is a copy of an earlier Greek version. "The Gospel of Judas'' was first mentioned around AD 180 by Bishop Irenaeus of Lyons, in what is now France. Bishop denounced the manuscript as heresy because it differed from the basic version of Christianity. Actual text was considered lost - until this discovery. Christianity in the ancient world was much more diverse than it is now, with a number of gospels circulating in addition to the four that were finally collected into the New Testament - noted Bart Ehrman, chairman of the Department of Religious Studies at the University of North Carolina. In the end, one point of view prevailed and the others were declared heresy, - he said, including the point of view of the Gnostics who believed that salvation depended on secret knowledge that Jesus gave, in particular, Judas. In Cairo, the editor of the Coptic weekly "Watani,'' Youssef Sidhu, said he was not ready to give judgment on the manuscript right now. The text of the newly translated document begins: "secret report - the revelation that Jesus spoke in conversation with Judas Iscariot." This indicates that Judas would help liberate the spirit by helping Jesus get rid of his physical flesh, - said commenters. "Step away from the others and I shall tell you the mysteries of the kingdom,'' - Jesus says to Judas, highlighting its distinct status from everyone." The text ends with the transfer of Judas in Jesus' hands high priests and does not include any mention of the crucifixion or resurrection. The author writes that Judas Iscariot alone understood the true meaning of Jesus' teachings. The material will be transferred to the Coptic Museum in Cairo, Egypt. Therefore, it can be accessible to all researchers said Ted Waite of Waite Institute.